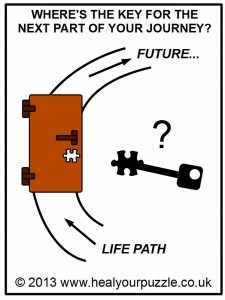 Heal Your Puzzle » Blog Archive » Do you have Keys for your Spiritual Doors? Do you have Keys for your Spiritual Doors? Want to unlock your potential? Are you missing something in your life? Working towards a particular Goal? Feel stuck or not sure where to go next? When you start asking these sorts of questions, your Subtle Self will try to organise all your knowledge to give you an answer. When the answer is elusive, it may be that you need a key for a particular door. The door itself may still need to be made by gathering puzzle pieces of experience but, if you notice any repetitive events in your life which are connected to keys, it is probable that your door is ready to be opened and you are ready to move on to a new phase. So where is your ‘Subtle Key’? When you meet someone new, there will be a period of getting to know each other. During this time, both of you will be communicating not just face to face but also throughout your subtle fields subconsciously. Areas of common interest may be found and a new friendship will form; you may even get an instant feeling of attraction romantically. The power of the connection between you both will depend on how many ‘Subtle Keys’ are identified in both your Subtle Fields, not just to use now but keys that are in the potential of the relationship. They will influence how long the relationship may last and may activate higher potentials for you both as individuals as well as for the relationship itself. This may all happen in an instant such as a brief conversation with a stranger bringing you astounding inspiration or unfold over time as in a marriage, in a work career or as parents bringing up children. WHAT ACTUALLY ARE SUBTLE KEYS? Rather than being a key to a lock, a Subtle Key is more like a code-breaker to help you decypher information in your Subtle Field; a puzzle piece which suddenly makes the picture become clear and everything starts to make sense. This is why we as humans socialise and why teamwork is usually more creative and productive than working alone; there is an actual interlinking of energy from different individuals to produce a new idea.